In 2014, for various reasons, there was a lack of interest in running State Championships. As the Cafe and Phoenix clubs were each running a club series at that time, they got together and created a combined series over both clubs to fill the vacuum. At each event run by those clubs, races are held where riders can score points in the Series. Awards will be presented at the end of the Series based on the total points scored over all rounds. 1. The following Awards are open to riders from any club. Steve Martin Cup: Trophies will be awarded to the highest scoring 1st, 2nd and 3rd riders (BCD grade). Trophies will be awarded to the highest scoring 1st, 2nd and 3rd riders. Highest scoring Supersport rider in the series. Note: The Steve Martin Cup, Steve Kerr Trophy and Tim Inkster Cup are perpetual trophies. The winning rider’s name is added each year. 2. 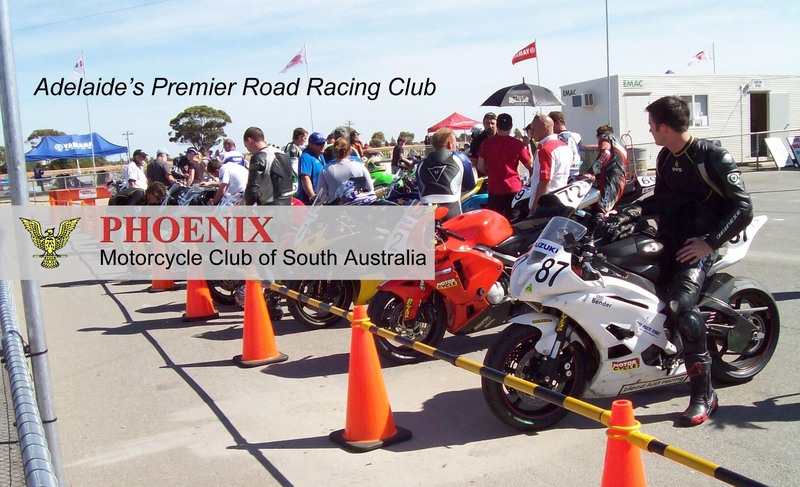 The following Awards are only open to members of the Phoenix Motorcycle or Café Racer clubs. Superbike: Trophies will be awarded to the highest scoring 1st, 2nd and 3rd riders (All grades). Trophy awarded to the highest scoring rider (CD grade). Supersport: Trophies will be awarded to the highest scoring 1st, 2nd and 3rd riders (All grades) . Pre Modern: Trophy will be awarded to the highest scoring rider.